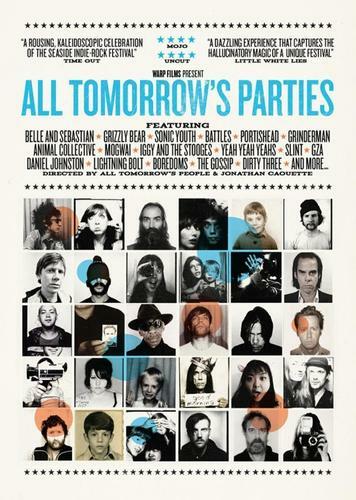 'All Tomorrow’s Parties' is a DIY concert film featuring performances from an eclectic mix of artists including: Battles, Sonic Youth, Belle And Sebastian, Patti Smith, Animal Collective, Grinderman, Iggy and the Stooges, Portishead, Mogwai, Slint, Grizzly Bear, The Yeah Yeah Yeahs, The Gossip, Daniel Johnston and The Boredoms. The film is a semi-found bricolage made from Super8, camcorder and mobile phone footage contributed by over two hundred filmmakers, fans and musicians over the festival’s recent history, with key contributions from co-director Jonathan Caouette (Tarnation) and cinematographer Vincent Moon (The Take Away Shows, Arcade Fire). 40 page full colour booklet (including 10 years of ATP artwork, programme introductions, and slipcase packaging). Over 50 minutes of full length performances. Commentary from ATP promoters Barry Hogan and Deborah Kee Higgins. Also, the DVD can be used to unlock updates and exclusive bonus content online, including Vincent Moon's footage from ATP New York and more full length performances. Available as PAL or NTSC versions.